This post was updated on 3/26/19 –ed. 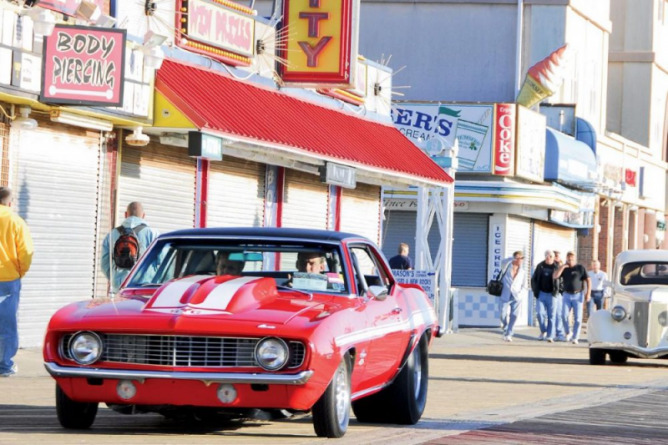 The 29th Annual Cruisin’ Ocean City returns to town May 16-17-18-19. 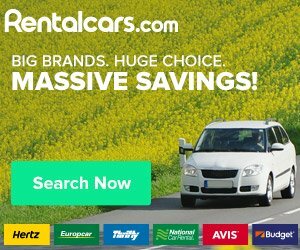 This nationally recognized event attracts more than 3,000 customs, hot rods, street machines, classics and more from over 20 states plus Canada. The 29th Annual Cruisin’ will have more than 10,000 event participants taking part in various car shows at the Convention Center on 40th Street, the downtown Inlet parking lot and various citywide locations. A new event for the 2019 season is the Cruisin Car Corral, to be held Thursday and Friday inside the Convention Center. To put your car in the corral, call 410-798-6304. Space is limited. New for the 2018 season was an additional location at the US 13 Dragway, in Delmar DE, just a quick drive from OC, MD. Like last year, events will take place Friday and Saturday during Cruisin’ weekend. More details coming soon. Scheduled to appear at this year’s Cruisin is Catherine Bach, best known for her role as Daisy Duke from the Dukes of Hazzard. Catherine will be at the Ocean City Convention Center Friday 11-4 and the Beachside Inlet on Saturday 11-4. 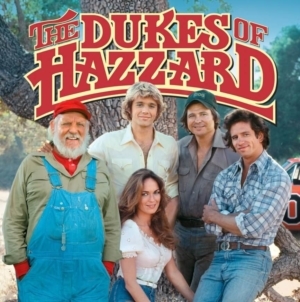 Celebrate the 40th Anniversary of the Dukes of Hazzard with Catherine Bach! Also scheduled to appear, from the hit show Counting Cars, meet Ryan Evans! Ryan will be at the Beachside Inlet on Friday 11-4 and inside the Convention Center Saturday 11-4. Taking the stage of the Ocean City Performing Arts Center during Cruisin Ocean City is Grammy Award Winner and Country Music Legend Joe Diffie on Thursday May 16, 2019. With 12 #1 hits including “Home,” “Pick-up Man,” “Third Rock from the Sun” and “John Deere Green” this is a show you won’t want to miss! Opening for Joe Diffie will be none other than Maryland Native and viral sensation Jackson Dean! Winner of the Maryland Music Award for Best Songwriter and Best New Breakout Artist Jackson recently gained recognition for his rendition of the National Anthem. All seats are reserved and can be purchased by calling Ticketmaster, 1-800-551-SEAT on online by clicking here. Some of the country’s top national names will be showcasing their products in manufacturers midway at the Inlet Parking Lot including Advance Auto Parts, Advantage Lifts, AMSOIL, Barrett-Jackson, COMP Performance, Covercraft Car Covers, CVF Racing, Detroit Speed, Flaming River, GEICO, Grundy Insurance, Krietz Auto, Miller Welding, Mothers Polish, QA1, Ridetech, Ron Francis Wiring, Summit Racing, Sundance Vacations, TREMEC and Wissel & Walsh. 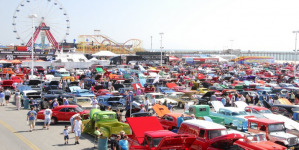 At the OC Convention Center there will be Treasured Motor Services, Pioneer Pole Builders and a variety of vendors both inside and outside selling automotive merchandise along with arts & crafts, jewelry, t-shirts and many other specialty items. There will also be a Swap Meet Thursday, Friday and Saturday inside the Convention Center. Additional vendors will be at the US 13 Dragway location. Additional Cruisin Ocean City highlights are the special Boardwalk Parades that will take place Thursday, Friday and Saturday mornings. Parades will begin at 8am from 26th street and cruise south to the Inlet. On Sunday the Grand Finale Awards will take place at the Beachside Inlet. Before Cruisin comes to an end there will be more than 500 trophies, plaques and awards presented plus over 3,000 giveaways. 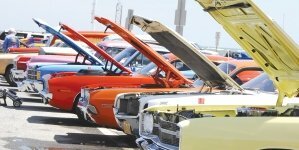 There is so much to see and do at this year’s event so make sure to mark your calendars for May 16-17-18-19, 2019 and cruise on down to Ocean City Maryland for the 29th Annual Cruisin Ocean City.